We are happy to announce that CoinGecko is setting up an IOST masternode. This will be the third masternode that we will be setting up after TomoChain and Steem. By running an IOST masternode, we at CoinGecko are looking to support the ecosystem to grow further. We hope by running an IOST masternode, we can gain first-hand experience on the various different blockchain governance mechanisms. Currently, we are working on setting up our IOST masternode and will be ready to begin validating blocks as soon as IOST’s Mainnet launches on 25 February 2019. The IOST ERC-20 election has already begun and we are ready to receive votes on IOST Biss. IOST is a project that seeks to deliver blockchain application platform to enterprise users for large-scale utilization. With this goal in mind, the IOST team has introduced a new consensus mechanism called Proof-of-Believability and also implemented several new improvements such as Efficient Distributed Sharding, Atomix Commit Protocol, TransEpoch, and Micro State Blocks. For more information on IOST, you may read our Introduction to IOST guide. The IOST election (currently using the IOST ERC-20 token) has already begun on 14 January 2019 and token holders may stake their tokens to vote in the election. Stakeholders who vote will receive an annualised 25% return on their token amount. There is an additional reward that will be shared with voters if CoinGecko is successfully elected once we reach the 2.1 million token vote requirement. 50% of the reward to CoinGecko masternode will be shared with our voters. There is a total of 840 million IOST tokens in the rewards pool that will be given out each year which is equivalent to approximately USD 5 million at the current price. How to Vote For CoinGecko? 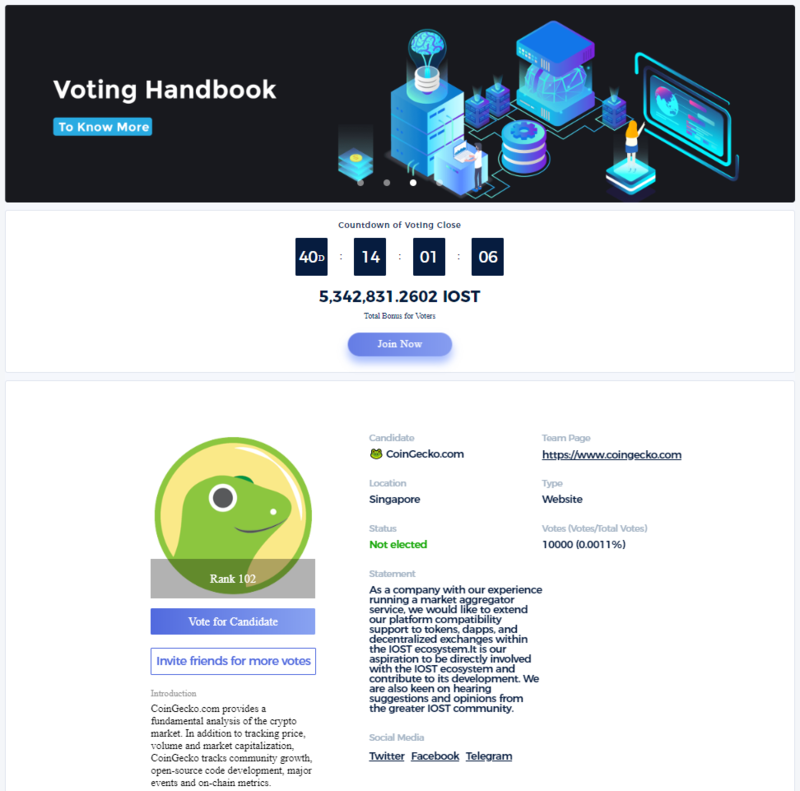 We recommend that you follow the official IOST step-by-step guide to vote for CoinGecko masternode using iost.biss.com. Our official IOST Masternode name is CoinGecko.com. By participating in the IOST ERC-20 election process, the IOST ERC-20 voted tokens will be automatically converted into IOST Mainnet tokens when the Mainnet launches.